There were 9 posts published in March 2009 (this is page 1 of 1). The article was a short one, written to stimulate debate in the luxury sector, where adoption of social media both lagging and also challenged as to whether it’s relevant to the sector. Research on this was really interesting, and I came across some fun companies (especially ThisNext.com which is now a firm favourite as an exemplar of social-meets-brands-meets-commerce). Asahi Black – Beers of Europe Ltd – Japanese Beer – Yay. At last a source of Asahi Black that's not just retail (ie Wagamama and Abeno). Delivery's a bit steep – maybe I should buy in bulk?? User:Matt/Famous Blogs « WordPress Codex – Famous blogs, eh? Good source of hard-working but smart WP template ideas. From punctuated futures to permafuture « Magical Nihilism – Interesting consideration of the word 'future' and how it might be reclaimed, considered and reused. The March issue of InternetRetailing’s hitting desks around Europe and we’re able to release the standings after the first ‘dimension’ of the Inspiration Index voting – on “Moments of Brilliance and Delight”. Results and the site review will be published in the May issue of InternetRetailing Magazine. You can subscribe to InternetRetailing magazine and our email newsletter on our publisher’s subscriptions page. You can grab the RSS feed or follow us on Twitter. Neuroscience provides a deep, clear view into the real-world, real-time reactions of consumers at the most elemental level: their brainwaves. The human brain reacts to stimuli in milliseconds. NeuroFocus captures these reactions thousands of times every second. These are the six critical metrics that determine consumers' engagement with your brand, with your marketing, with your messaging or other content. " Hacker Public Radio – Nice site, nice idea, well implemented. Hacker podcasts, by experts, for experts, but with others able to listen in. So, the ugly, ink-swilling, temperamental Epson Stylus Pro 1270 finally died a death. Total inability to feed paper (bit of a disadvantage in a printer). So, with Vicky having a book to get ready for London Book Fair it was back to the PITA of finding an A3 colour printer for high quality home office use. Firstly, we bought a Canon Pixma 9000. The reason was the great reviews (rave, in fact) of the image quality, PLUS the fact it had 8 ink cartriges, build quality of an armoured vehicle and we didn’t want to touch Epson again. The first thing I should have realised were that all the reviews were from PC users, raving about the step up in quality. The ‘Mac compatible’ bit lulled me into a false sense of expectation. Rookie error. So, we get it home (weighs a ton) and set it up and pages just RACE through it. I’d read that it was 5 mins/page in highest quality, but the test print ran through in about 15 seconds for A3. Hmmm. The quality wasn’t great, so I looked for the ‘quality knob’ to twiddle and couldn’t find anything over and above the most basic settings. This was the same in every application. The root cause is that Canon has not created a ppd for the printer on a mac. This means that the output is essentially just draft quality inkjet. There’s no way to control the cunning ink reservoirs, colour balance and profile, resolution etc. It’s SO annoying. The choice then was to retrieve the packaging from the recycling dump (!) or ‘make it work’. Go to Canon’s site and get the latest “installer” for the Mac. This does not include a PPD and there’s no ‘driver’ available on their site. FAIL. TurboPrint has a mac-specific printer driver suite called (catchily) PrintFab. €49, but we needed the €79 version (interesting licencing approach – you need a more expensive licence to print bigger pages! The entry level just supports A4, while the ‘pro’ supports A3 and A3+). I admired greatly through gritted teeth as I downloaded. PrintFab installs as a new printer and – after a restart (bah) there’s a total transformation. Not only is the basic output better (certainly ideal for proofing), but the quality twiddling is nothing sort of breathtaking. ICC profiles, gamut adjustment, ink-by-ink adjustment (directly by ink mix, RGB or CMYK adjustments). The ink-saver mode is really useful and the photo quality is photolab level on 6×4 and 5×7, and passable for a 10×8. More work needed on this. So, we now approach happiness. The Canon’s delivering on its promise and we have a great step forward from the (admittedly ancient) Epson. We also have a whole pile of new things to learn – colour profiles? Ugh. Whatever happened to “just press Apple+P” ?? 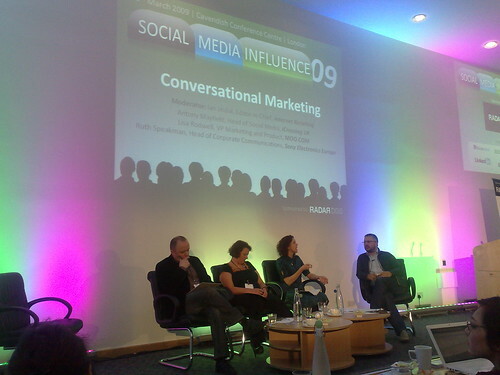 Last Tuesday I wandered over to Social Media Influence 2009, organised rather well indeed by Matthew Yeomans (about) and Bernhard Warner (about) (once of CustomCommunications, and now the newly-formed RadarDDB). The event promoter was none other than Mark Pigou of InternetRetailing fame. Anyone interested in a venues “name and shame” website? Interestingly (as I ranted) I found out that one’s not even allowed to install one’s own connection – closed shop, restraint of service, cartel… I suggested to Mark that at our next conference we print in large letters across the programme that “We apologise for the crap internet connection here: it’s due to the profit-gouging, neo-luddite, short-termism of [manager’s name] of [venue]”. Grrr. The dongle-carrying, macbook-waving twitterati at the conference were not to be defeated, however, and it was quite a surreal experience to look behind the speakers and see a live ‘twitterfeed’ of the conference proceedings projected large, while looking at the screens of the assembled folk watching and writing tweets on their laptops. So meta it was hardly being there! The conference brought together a good group of people and there was lots of time to chat, catch up with people and exchange ideas. In addition to the tweet tag (#SMI09) you can also see a collection of assorted web coverage and feeds on the SMI Netvibes page. I was pleased to be invited, along with Frederik Nieuwenhuys of Fredhopper.com, to give the keynote at the IADS meeting in Amsterdam on Thursday, looking at the future for department stores online. We received a warm and open welcome at the de Bijenkorf flagship store for two days. My pleasure turned quickly to a feeling of privilege, however, during two days of open, candid, revealing and utterly stimulating presentations and discussions. I’m unable to recount details or attendees, but I can say that the leading stores in the UK, France, Germany, the Netherlands, Turkey, Mexico, Sweden, Spain, Switzerland and Chile were represented. A further highlight was the informal discussion time in the evenings, where I found in particular the directorate of IADS to be in possession of a mine of information, challenging ideas and an archival historic view on the sector… We’ll be hearing more of this in future issues of InternetRetailing! a focus on growth (surprising in this economic climate) – geographically, in terms of range and scale of operations. I’ve lost count of the number of conferences I’ve sat through, but I can’t remember the last time that I sat through two days without a single weak presentation, scribbling notes and ideas all the while and having my preconceptions challenged to regularly. In my view this emphasises the benefit of smaller, peer meeting that allow for candour. I’d certainly be pleased to attend any further events by IADS based on this exemplary conference, and will reflect on the format for upcoming InternetRetailing events. A well-spent couple of days. After a week or two of conferencing and marketing meetings I’m getting a bit sick of the talk of ‘branding’ and ‘brand values’. Call me curmudgeonly, but I hold fast to the notion that I as a consumer bestow ‘brand’ status on a product or service and that this status is something earned as a result of some underlying value: working as or better than claimed; consistency; transparency; fair dealing. And then a little bit of desire and ‘wow’ to finish things off. A friend, let’s call her “Nicole” for the want of a spare false name, had recently requested a PAC code from her mobile provider (let’s call them T-Mobile, just for the sake of the story). The PAC code closes your account and allows you transfer the number to another network. As well as a PAC code, the request invariably triggers calls from the bowels of the contact centre and the ‘customer recovery’ team – those rare beasts empowered to grant your tariff desires, issue free phones, and generally persuade you to cancel the request and ‘de-churn’ yourself. Said T-Mobiler introduced himself to “Nicole” and started the spiel. “Nicole” tried to cut him off saying that nary a blandishment nor inducement would change her mind and could he please leave her alone. Silence for 10 seconds. Then – “You’ve bought an iPhone, haven’t you”. When even your competitors’ battle hounds decide to go home and floss their teeth you know that your brand is in a strong position.